If you’re looking to give carpets a good deep clean, then something well worth considering is a relatively new technology; encapsulation or encap as it’s often referred to. You may well have never heard of this before. Encapsulation, as a cleaning method, was really only “discovered” in the 1990s, and though it has grown in popularity since, it’s still something that a lot of people are not aware of. With encapsulation, a solution is applied to the carpet via a number of methods: it might be applied using a rotary machine, CRB counter rotating brush, a brush applicator, or a compression sprayer. The method of application doesn’t really matter, though; what’s important is that the solution gets worked deep into the carpet. What happens then is the cleaning compound in the solution absorbs and crystallises around dirt in the carpet, before being vacuumed up afterwards. This method of cleaning is really popular for carpets that have high volume of traffic. Because there’s no drying time or need for shampoos, the length of time that a carpet needs to be treated before cleaning has finished and can be used again within a very short time. In most cases, cleaning can be finished and the carpet back in use in less than an hour. There’s also the added benefit of reducing carpet degradation by wetting it less frequently. The cleaning method is also a relatively inexpensive one, as the equipment needed to clean is minimal, and the need for operator training is minimal; it’s the kind of solution that almost works by following instructions on the box, so to speak. 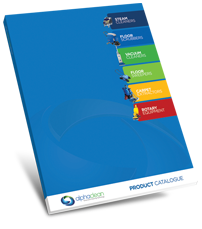 Where is encapsulation cleaning most effective? 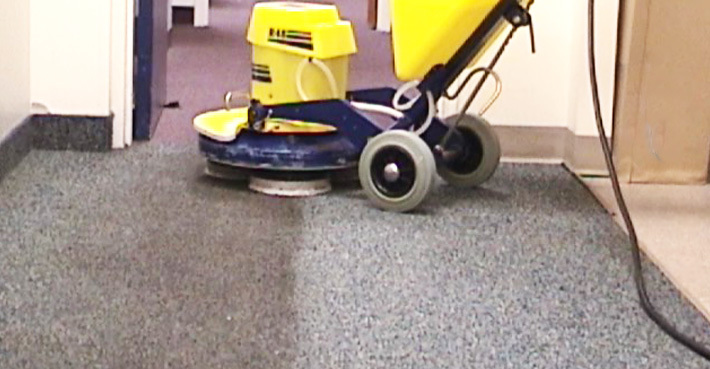 The encapsulation technique is more effective in commercial, high traffic environments, partly because it is a rapid cleaning process with minimum downtime, but more importantly, because the effectiveness of the solution is dependent on factors including how much soil (either visible or invisible) is in the carpet, and the carpet type itself. For home use, often carpets are of a different design, thickness, and function to commercial spaces, so the encapsulation cleaning method can be less effective. That being said, for home environments, an encapsulation clean can be an effective part of the maintenance process. Starting with a hot water extraction clean, and then scheduling regular encapsulation cleans as interim cleans is an easy and inexpensive way to maintain your carpets. Of course, the quality of the solution itself is very important to encapsulation cleaning, and the difference between what can be achieved with a good product, compared with a bad one, is significant. There’s a simple test you can do to test the quality of a range of different encapsulation solutions. Take a couple of drops of an encap product, and leave it in a glass dish overnight. A good encapsulation product will form perfect crystals by the morning. A weak solution will look sticky, gooey, or not completely dried. It’s in the crystallisation that the soil is held and able to be vacuumed, so if a solution isn’t forming crystals quickly or efficiently enough, the solution will be much less effective in cleaning any carpet environments. The first step is to vacuum using a brush within the vacuum and clean to remove the top 80% or so of dirt from the carpet. Adding the solution before that’s done will make it difficult for the solution to “pick up” the dirt more deeply ingrained into the carpet. From there, add the solution to whatever scrubber you might be using, and then work it over the carpet at a moderate pace. You’ll only need to pass over the carpet once while applying the solution. Be careful to avoid over-wetting the carpet, however. A few litres of properly diluted solution should clean approximately 100 m2, so applying the solution is more a case of a light coating than a drenching. Although you will see a major difference in the clean, the key is to ensure the vacuuming is done frequently in order to collect all the crystals. It may take a few vacuums over a period of time before all the crystals are collected up, but that isn’t an issue. As a “dry” cleaning method, encapsulation means that once the dirt has been picked up by the crystals, it can then be vacuumed up at any point. At Alphaclean we have a number of different machines that can help you make the most of the encapsulation method for carpet cleaning. Whether commercial or residential, our equipment is fully compatible with any cleaning strategy that makes use of encapsulation cleaning techniques. For further information on carpet cleaning and encapsulation, contact Alphaclean today.